· Finally, the temperature and duration of its cooking. Commit the following brief information and table to memory and you’ll find a new ease and enjoyment in cooking for yourself and others. The method of cooking Landtasia Certified Organic Beef is largely determined by the cut to be cooked. For example, tender cuts of meat, such as Eye Fillet, Sirloin, T-Bone, Topside, Scotch Fillet and Rump benefit from fast, high-heat cooking while tougher cuts, such as Blade, Round, Silverside and Chuck benefit from a slower and longer cooking method. Tender cuts of beef from the loin and rib are best cooked via dry cooking methods, such as barbecuing, grilling, roasting, and sautéing. 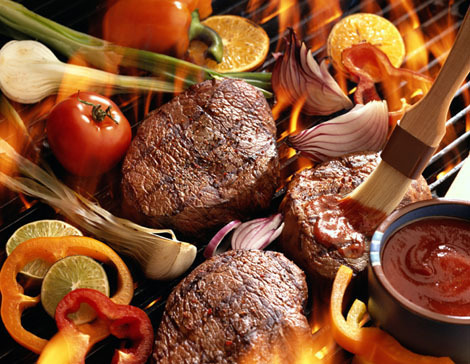 Barbequing is characterised by cooking the beef over a high heat source; generally in excess of 343°C (650°F). This leads to searing of the surface of the beef, which creates a flavourful crust. Grilling is similar to Barbequing, except where Barbecuing is performed with the heat source under the beef, Grilling is usually performed in an oven with the heat source above the beef. .
Roasting or Broiling heats the meat from hot air and the meat is cooked all around. Little if any liquid is added. The liquid produced during cooking is decanted from the fat and usually made into gravy to serve with the sliced beef. Carpaccio: Raw beef from the finest cuts may be prepared with the option of searing the sides of the fillet for a few seconds before thinly slicing. This is usually served with lemon slices, which when squeezed over the raw beef 'cooks' it. Temperature, or doneness, is a description of how thoroughly cooked a cut of meat is based on the color, juiciness and internal temperature when served. The gradations of cooking are most often used in reference to beef (especially steak) but are also applicable to lamb, pork, poultry and veal, . Times are calculated for meats at room temperature. These are approximate guidelines since times vary with the shape of the cut (and the efficiency of your oven or grill) so it’s best to use a meat thermometer. Cook until steak feels very soft with the back of tongs. Steak will be cooked to medium rare when it feels soft with the back of tongs. Steak will be cooked to medium when it feels springy with the back of tongs. Mostly gray centre, firm texture. Reduce heat slightly and continue to cook until steak feels firm with the back of tongs. As meat is cooked, it turns from red to pink to brown to black (if burnt), and the amount of blood and other juices decreases with longer cooking. Well done cuts are dryer and contain little or no juices. Cuts of beef from the Round, Brisket, Shin, and Chuck prime cuts are often cooked by moist heat cooking methods, such as braising, pot-roasting, and stewing. Steak cut from Round and Chuck can produce delicious results also by dry heat methods especially when they are tenderized with a marinade. Stewing involves immersing the entire cut of meat in a liquid. Braising involves cooking meats, covered, with small amounts of liquids (usually seasoned or flavored). Unlike stewing, meat cooked via braising is not fully immersed in liquid. Resting Meat - The interior of a cut of meat may still increase in temperature 3–5°C (5–10°F ) after being removed from the grill or oven, and the meat should therefore be allowed to "rest" before being served, which allows its temperature to stabilise, the juices to be redistributed and the meat fibres to relax. Allow 10 minutes for roasts and 3 minutes for steaks and chops. Cover loosely with foil while resting. How to Make a Simple Jus - Remove the cooked roast from the roasting tin and set it aside, loosely covered, to rest. Pour off any excess fat, place the roasting tin over medium heat and add 150ml of any flavourful stock. Bring the stock to the boil and scrape the bottom of the tin to dissolve all the roasting particles. Season to taste and drizzle over the sliced roast. A Matter of Size - As a general rule, the more people you are catering for, the less food per head you need to provide. For instance, while you need 225g stewing beef per head for six people, 175g per head will feed sixty people. Pleasurable Eating - Use Sharp Table Knifes – the perfect way to engage and enjoy a well prepared cut of meat at the dinner table is with a sharp non-serrated knife. You want the table-knife’s edge to be smooth and sharp so that it glides through the grain, not saw through it. A good sharp knife can make even less tender cuts more enjoyable, because of the ease to cut thin slices for your mouth. The currently popular serrated or ‘jumbo’ steak knifes make cutting meat a chore and result in unappealing shredded and torn edges. With these sawing type knifes, people don’t experience the joy and savour of engaging with good meat that adds to its underlying experience of satisfaction and wellbeing. Good nutrition, satisfaction and wellbeing, these are the goals of eating.